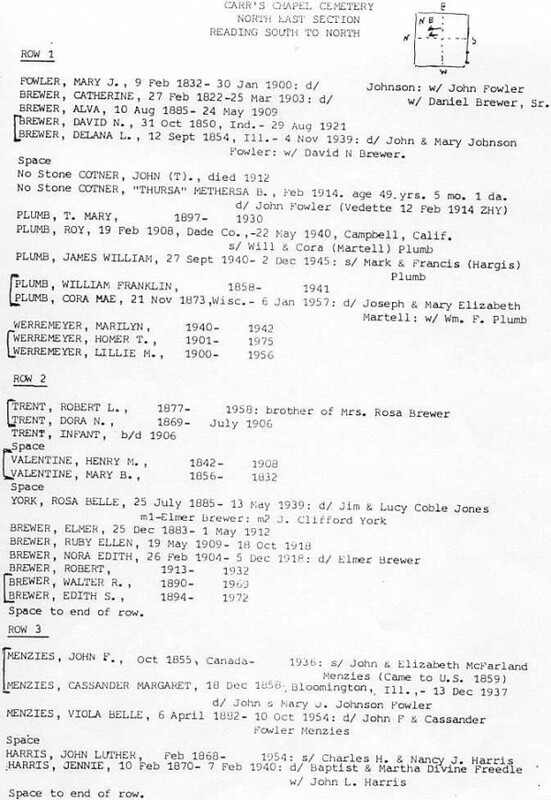 Courtesy of Nancy Benton, this document shows the rows in which certain members of the Brewer family are buried at Carr’s Chapel Cemetery in Dade county, Missouri. 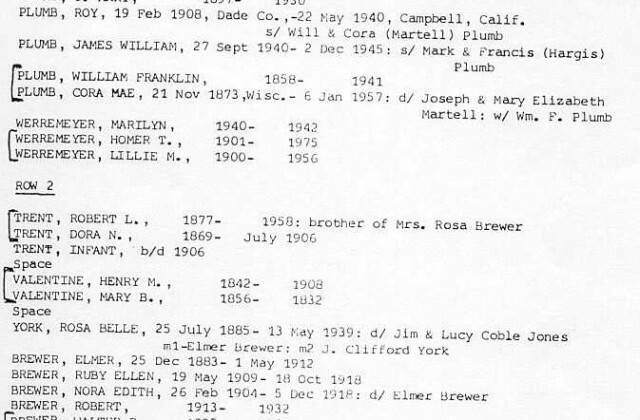 In row 1 is Mary Johnson Fowler, wife of John Fowler (direct line), Catherine Hedden Brewer, wife of Daniel Levi Brewer (direct line), Alva Brewer, son of David Nathaniel Brewer and Delana Louise Fowler, David Nathaniel Brewer and Delana Louise Fowler Brewer (direct line). In row 2, we have, Robert Lincoln Trent and his first wife, Dora Nancy Fowler Trent, daughter of John and Mary Jane Fowler, and an infant that would have been a child of Robert and an infant who perhaps died at the same time as Dora. Elmer Brewer was a son of David Nathaniel and Delana Brewer. Next to him are his daughters Ruby Ellen and Nora Edith who both died in 1918, perhaps victims of the great influenza epidemic. We see next to them Robert Walter Brewer and his wife, Edith, and their son Robert.